I just had the opportunity to write about something I’ve never previously discussed in any RVtravel article or forum – but I believe it’s vitally important for any RV owner who camps in areas with questionable electrical power. Here’s the situation: What if you’re camping in Mexico or somewhere in the USA where campground pedestals may have reversed polarity and a missing ground connection? While your Intelligent/EMS surge protector should warn you about the missing ground, all they’ll do is shut down the power. And there you sit, without any electricity. But what if there were two very affordable products that you don’t normally need, but could be real lifesavers in any campground with an antique/ungrounded electrical system? Well, there are, and they will allow you to power your RV from an ungrounded 20- or 30-amp outlet on a pedestal with complete safety. And yes, this is an NEC-approved fix that I’m applying to this otherwise deadly scenario. Interested? Then read on…. I have a problem that somehow worries me and I need some expert advice. At Mexican campgrounds it is quite common to find reverse polarity or open ground (no ground wire) on your electric hookup. As I am from Germany and in Europe reverse polarity does not exist (you can plug in a socket either way), the reverse polarity did not bother me so far. Until today I thought a ground wire is only needed if there is a faulty wiring in something with an f.e. metal housing. I was sure my Four-Wheel-Camped would not have a faulty wiring. Here is my problem: Connecting to a socket with reverse polarity and open ground I measure 50 volts on my door handle (not the knob but the grip I use to swing myself up in the camper) – really shocking!! I have felt these shocks on different campgrounds but not as strong as this time, so I started measuring with my voltmeter. Changing the polarity gets it down to 40 volts. Grounding by using an earth pin gets it down to zero volts. Now this can`t be OK. Somewhere in my 110-volt system there must be a problem that lets my camper housing get half of the voltage. The key to understanding how you can develop a hot-skin/stray-voltage is to realize that hot-skin voltage comes in several different versions – what I call low-amperage, medium-amperage and high-amperage fault currents. Any of these can develop whenever you have an open “ground” connection (actually call the EGC or Equipment Grounding Conductor) that’s bonded to the incoming service panel’s G-N (ground-neutral) bonding point. Note that putting in your own ground rod doesn’t actually “ground” your RV. A Low-Amperage hot-skin is caused by normal leakages inside of your RV appliances, and typically is just a few mA (milli-amperes) up to maybe 20 or 30 mA, depending on appliance leakage. Even a surge protector strip inside of your RV can leak enough current to the chassis-ground to create this level of fault current. And it typically results in a hot-skin/stray-voltage of around 50 to 60 volts (1/2 the line voltage). If it’s on the low side of a few mA, then you might just feel a tingle if you stand on the wet ground and touch your RV. If it’s 20 to 30 mA (from combined leakages that could still be within UL limits), then you would feel a really big shock, possibly so much that you can’t let go of anything you touched while standing on wet ground. And 30 mA (0.030 amperes) is the lower limit of sending your heart into fibrillation, which can be deadly with just a few seconds of contact. This is the only type of fault that would have its voltage lowered by your own ground rod with perhaps 25 ohms impedance. Medium-Amperage hot-skin voltage is typically a few amperes or so, and many times caused by a water heater element that’s lost its hermetic seal from overheating or rusting out. This usually results in 80- to 120-volts hot-skin, and is easily deadly if you’re standing on wet ground and touch anything metal on your RV. Note that this is NOT a short, just a medium-impedance shunt to chassis. This 2 or 3 amperes of current going into the water isn’t enough to trip a circuit breaker, but it would overwhelm any ground rod. And, of course, this 2 or 3 amperes of current isn’t enough to trip a 20-, 30- or 50-amp circuit breaker, which is why this type of failure can exist for extended periods sometimes. You may not even know you have a failed water heater element if your grounding circuit works properly. But you’ll certainly know it if your ground circuit fails. 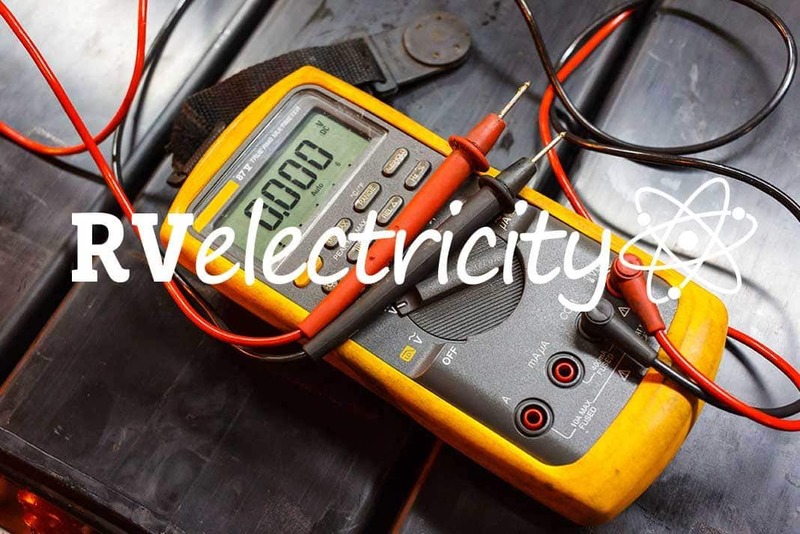 High-Amperage hot-skin voltage is usually the result of a short-circuit from an electrically hot wire to the RV chassis, typically when the insulation of a wire rubs through and makes direct contact with the chassis, or perhaps a screw is driven though a wire inside of a wall (oops). This can provide up to 30 or 50 amperes of fault current and should instantly trip any circuit breaker. Again, this is the only fault condition that’s actually a short circuit. And if you’re standing on wet or even damp ground when touching your RV, there’s a very good chance that it could be deadly to your family or pets. While plugging your RV into an ungrounded outlet can never be 100% safe, there’s an inexpensive solution that should keep you and your family safe if you have to plug into ungrounded shore power. But the basic version only works for 20-amps of power, and there’s a 30-amp version if you really need the extra power. Unfortunately, there’s no portable 50-amp version available. In the U.S., all outside 20-amp outlets are required to have a GFCI protector, and if you have to plug into one of these without a ground connection, as long as you test the GFCI for proper operation you should be safe. You can use the built-in test button to make sure it trips “off” when you push TEST. 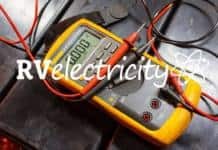 So even if there’s a missing “ground” connection and your RV has a 60-volt or even 120-volt hot-skin voltage, you should still be safe from shock. However, many older campgrounds and countries with less than stellar electrical codes (you know who you are) don’t have GFCI outlets. So you can bring your own external GFCI to protect you from a lost ground wire. Any of the big box stores or Amazon sell short 20-amp contractor extension cords that include built-in GFCI. Plug it into the questionable campground pedestal, plug your RV’s shore power cordset into it, and you’re instantly protected from shock. However, I don’t consider this to be a permanent fix for a home outlet that’s missing a proper EGC/ground. So if you own it, fix it. Click HERE for one on Amazon. There are also cord-mounted 30-amp GFCI’s that can perform the same function if you need to plug into a 30-amp pedestal that’s missing the ground. Surge Guard makes a 44750 30-amp Ground Fault Interrupter that costs around $65 to $75 that should protect you from an ungrounded 30-amp pedestal. Buy it on Amazon HERE. This is actually allowed by code since it should protect you from electrocution (being killed by electric shock), but you might still feel pretty strong shocks less than the 8 mA trip point. And be aware that GFCI circuitry is active and can fail due to nearby lightning strikes, which is why you need to test them for proper operation EVERY TIME you plug into one as your primary source of ground protection. You can find out more about it HERE. Much more on this later, but that’s the basics of how to protect yourself from electrocution if you’re in a less-than-ideal shore power situation without a ground connection. But you’ll likely have to disable your Intelligent/EMS surge protector if you need to use ANY ungrounded power outlet from a home or campground pedestal. And that also gets rid of your over-voltage protection, so be sure to measure the pedestal voltage carefully BEFORE you plug in. TANSTAAFL (There Ain’t No Such Thing As A Free Lunch). Hope this makes sense. Please leave any questions in the comment section below. Let’s play safe out there, especially around electricity…. Would GFCI circuit breakers — installed on the RV power center — help with this problem?? Maybe under a few circumstances a GFCI in the RV load center might help protect you, but probably not. For a GFCI to be totally effective it would need to be located upstream of the trailer load center, preferably at the campground pedestal. What with the horror stories on Facebook, and the electrical possibility of cardiac arrhythmia, I am just about to give up the dream of ever having an RV. There doesn’t seem to be anything good, over packing the rig, killing a whole park electrical system, making major mistakes about who you buy from, how you finance and being up side down from the very beginning.. Thanks for the advice and perspective Mike. I can’t come up with these important topics without your questions, so please keep asking them. Will a 20A GFCI any add protection when plugged into a Honda EU2000i inverter generator? Without an earth-ground on the Honda, can the GFCI work? No need to add a GFCI on a generator that’s not grounded, and your EU2000i shouldn’t be grounded with a ground rod. And you’re correct that without an earth-ground on a generator a GFCI won’t trip anyways. I’ve just looked at the latest electrical code and modern GFCI schematics, and it appears that the current generation of 120/240-volt, 2-pole, 50-amp GFCI’s might work with separate 120-volt loads by using a basic wiring change in the panel. However, there’s more to study, so I’ll call one of my GFCI engineering colleagues next week to confirm. I have a hard wired progressive industries hard wired 50 amp surge protection device. I’ve been in situations w/o ground, and been unable to bypass missing ground condition on 20 amps. Is there anyway to bypass unit? I think there is, but I’ll have to check with my contacts there on Monday. I’ll let you know next week. Wouldn’t this work for those requiring 50 amp service?